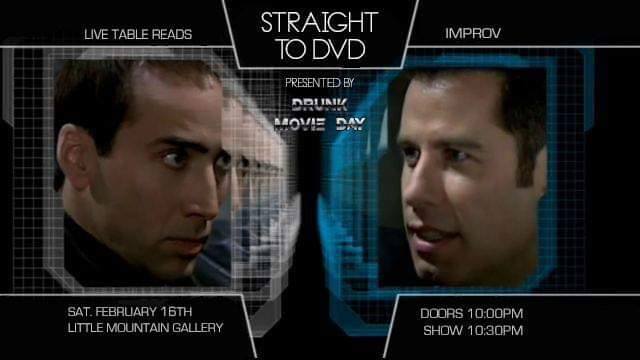 On February 16th @ Little Mountain Gallery: Straight to DVD returns! It’s going to be a night filled with scenes from movies that do not exist. Comedians will perform their scenes in a rehearsal/table read hybrid for you’re viewing pleasure. You’ll laugh, you’ll cry, you’ll be aroused all at once. Comedians include: Kevin Lee, Carmelahhh Comedy, Nathan Hare & Graeme Achurch, Abdul Aziz & Aaron Charles Read. PLUS: we’ll have improvisers pitching a brand new movie as well as auditioning for a super serious one.